Cha till e gu brath gu la na cruinne. Cárn Cuimhne Clann Mhic Cruimein a bha o dhualachas nam Piobairean aig MacLeòid fad dheich ginealach agus a bha cliùteach airson Deilbh is Cluich is Teasgasg Ciùil Mhoir is ann dlùth air an làrsach so a bha Sgoil Chiùil Mhic Cruimein. 1500-1800 A.D. The Memorial Cairn of the MacCrimmons of whom ten generations were the hereditary Pipers of MacLeod, and who were renowned as Composers, Performers and Instructors of the classical music of the Bagpipe. Near to this spot stood the MacCrimmon School of Music. 1500-1800 A.D. The MacCrimmon Memorials were unveiled on Wednesday, 2nd August, at Borreraig and at Kilmuir Churchyard in presence of a large concourse of people. The MacCrimmons became imbued with the spirit of Skye, and expressed it in the exquisite music on the pipes. All the wild grandeur of the Coolins, the stillness of the blue waters that flow through Skye like silver strands; all her romantic story, all her poignant history, her laughter and her tears are in the pibroch. Little wonder then that such widespread interest was taken in the ceremonies which took place last week, when people flocked to Borreraig and Kilmuir to pay homage to the greatest pipers the country has produced. The famous Coolins and all the mountains that add to the glory and grandeur of Eilean a Cheo were enshrouded in mist, so that those who were visiting Skye for the first time lost much of the charm of the island. 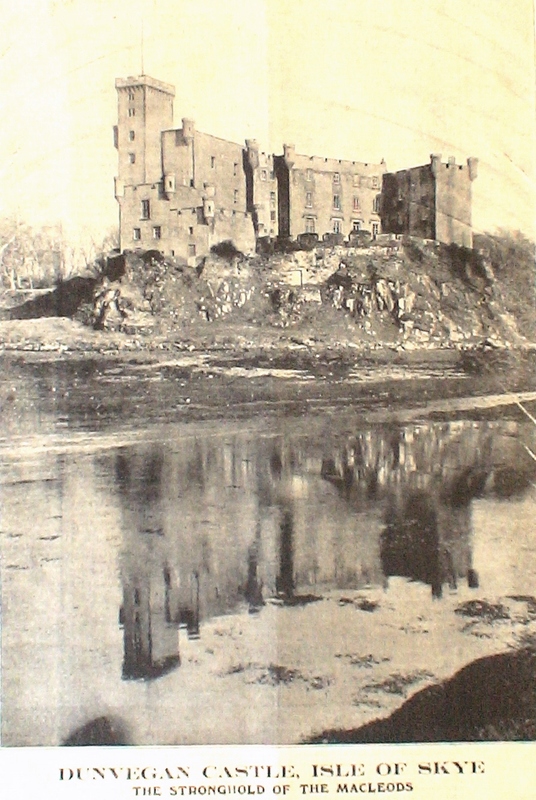 The house party from Dunvegan Castle arrived by the steam yacht Ketch, owned by Mr. Norman Heathcote, nephew of MacLeod of MacLeod, and these were the [sic] MacLeod of MacLeod, Mrs. Walter, Miss Heathcote, the Earl of Cassillis, the Very Rev. Dr. Norman Maclean and the Hon. Mrs. Maclean; Rev. Dr. Neil Ross, C.B.E., Mrs. and Alasdair Ross; Mr. And Mrs. Fred T. MacLeod and Norman MacLeod; Miss Heloise Russell-Fergusson, Ardtur, Appin; Mr. William C. Robertson of Orbust, and Mr. and Mrs. Seton Gordon, Durntulm. A procession was formed and led by the Portree Pipe Band playing suitable airs the company soon arrived at the Cairn, which stood out prominently on the hillside. Among those present were Mrs. MacLeod of Skeabost and Mr. Jack MacLeod; Mrs. Campbell (Airds), Professor Milne, and Mrs. and Miss Milne, Aberdeen; Mr. R. C. MacLeod, Secretary of the Clan MacLeod Society, Edinburgh; Professor Davidson, Aberdeen; Mr. D. S. MacMillan and Miss Annie I. MacMillan, North Bank House, Portree; Mrs. R.R. MacMillan (Mary B. MacLean), Carluke; Mrs. MacDonald, Viewfield, and party; Miss Stewart, ex-Superintendent Mackinnon Glasgow Police, and Miss MacKinnon. Colonel Macaulay, Golspie; Mr. Neal MacCrimmon, Solomon Islands; Dr. Calum MacCrimmon, Gullingham, Kent; Miss Mann and Miss Davie, Craigronach, Portree; Mrs. Gilmour, Viewfield, Portree; Mr. J. D. Fraser, do., Mr. J. M. Graham, Kyleakin; Misses Margaret, Jessie and Morag MacLean, Glasgow; Miss Annie MacLeod, Stornoway; Miss Alena MacLeod, Stornoway. Mrs. Martin Hardie, Lochawe; Mr. D. M. Mathieson, Stornoway; Mr. Lachlin MacKinnon, Glasgow; Dr. Calum Stewart and Miss E. Stewart; Mr. Alastair Grant, Glasgow; Mr. and Mrs. Matthews, Tweedmouth, Berwick-on-Tweed; Mr. Hugh MacCorquodale (“Fingal”), Mr. J. Stevenson, Glasgow, and representatives from the Clan MacLeod Society present, among others, were Mr. Wm C. MacLeod (Orbost), V.P.,; Mrs. MacLeod-Easson, V.P. ; Major R.C. MacLeod, Hon. 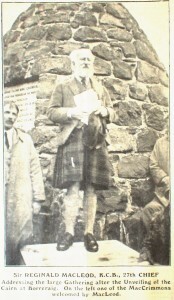 Secretary; Mr. J. Norman MacLeod, Council, and many others. It is a matter of great pride to me to find myself called upon to speak to so great a gathering before this memorial cairn which has been erected in perpetual memory of the MacCrimmons. Who were the MacCrimmons? Their origin is lost in the mists of antiquity but for nearly 300 years, from 1500 to 1800, they were hereditary pipers to the MacLeods, and the recognised authorities on pipe music in Scotland, eminent as composers, eminent as players, eminent as teachers. Wonderful, is it not, that for three centuries this family should have occupied this land of which we stand, in hereditary right, in full view of Dunvegan Castle, the home of the Chiefs they served. With the close of the eighteenth century they passed away. There is no longer a MacCrimmon piper in the Castle, no longer a musician working at Borreraig for the perfection of his art. The MacCrimmons have gone; the MacLeods remain. And I feel that those who have promoted, and made possible the erection of this memorial have a right to call upon me, the 27th Chief of MacLeod, to pay my tribute to their memory. What men must the MacCrimmons have been to attract students from all over the Highlands to this wild spot, 60 miles from the mainland, in an island roadless and very difficult of access in those early days. 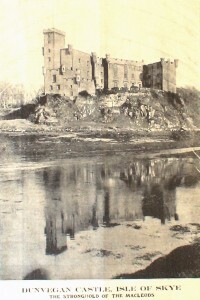 During the three hundred years of the MacCrimmon reign, there were eleven known as pipers to the Dunvegan Castle, two of whom stand pre-eminent. Patrick Mor MacCrimmon flourished under Sir Rory Mor MacLeod of Dunvegan, who was himself the hero among the Chiefs of that family. The importance of the piper’s office was recognised in that the Privy Council, bent on enforcing economy, directed reduction of retinue in the households of the greater Chiefs, but were unable to contest the pipers’ right to retain an attendant whose sole duty was to carry his master’s instrument. To Patrick, who must have been an old man, a conspicuous honour was done by King Charles the Second. In May 1651, when the King’s army was lying before Stirling, there was a competition among the pipers, 80 of whom were present. The King, noticing that one received special respect from the others, called him to his side and gave him his hand to kiss, whereupon MacCrimmon rose from his knees and played, extempore, the tune–a great favourite to-day “I gave a kiss to the King’ s hand.” I can only refer to Donald Ban, who held the post of hereditary piper in theperiod of the ’45. The Chief ordered him, on leaving his forces from the Castle, to play “MacLeod’s March,” which might inspirit is men. Donald Ban, overmastered by feeling, played “MacCrimmon’s Lament,” in which he foretold his own death–”MacLeod may return, but MacCrimmon shall never.” His forecast was realised, for he was the only man to fall, by an accidental bullet in a night skirmish near Inverness. In the College they taught only what is known as the “great music,” pibrochs, as distinguished from the “lesser music,” marches, strathspeys and reels. As regards pibrochs, one has only to glance at the titles of some of the best-known to realise their variety of subject matter. They comprise salutes to Chiefs, welcomes to Loyalty, gatherings of the clans, farewells to persons and places, battle tunes and marches. Those of us who to-day rejoice in the preservation of the MacCrimmon music, illustrated by modern masters of the art, acknowledge with gratitude the patriotism, enthusiasm, and practical generosity of the Highland Society of London, which, in the early years of the nineteenth century, stimulated interest in bagpipe playing by the holding of periodic competitions, and which in 1838 was largely responsible for the publication of a volume which contains the earliest categorical account of the MacCrimmons. To-day, that Society is still continuing its beneficent work, and its example has inspired the present-day activities of the Scottish Piobaireachd Society, the Scottish Pipers’ Society, the Highland Pipers’ Association in Edinburgh, and kindred societies. 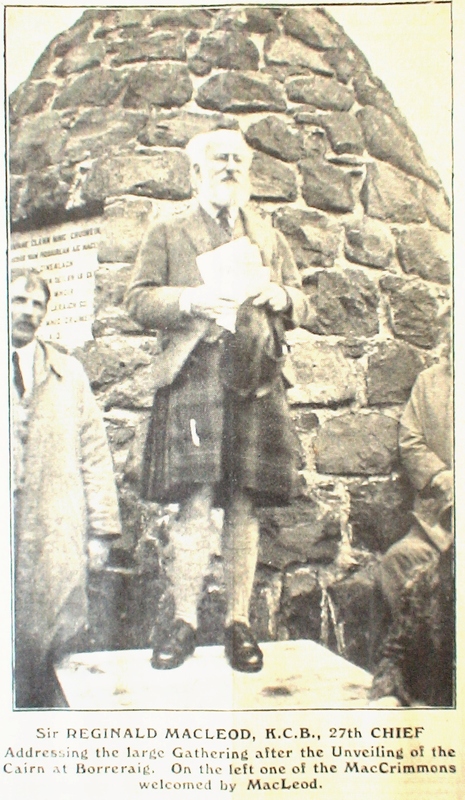 In conclusion, MacLeod of MacLeod referred to the work of Mr. Fred T. MacLeod, who had originated the memorials and been largely responsible for that day’s celebrations, also to Rev. Dr. Ross, who composed the inscriptions, and to those who had been responsible for carrying out the work of design and erection. Pipers from the Skye Piobaireachd Society took part in the ceremony, and there were representatives present from the Royal Celtic society, the MacLeod Society, the Piobaireachd Society, and the Scottish Pipers’ Society.